There are infinitely more comedians working today than you realize, but that's only because most people only hear about and go out of their way to see the most famous comics who have specials on Comedy Central and star in their own TV shows. What you may not realize is that there's a long career of not being famous for many comedians before they catch their big break, and even if that breakthrough finally happens, it may not last. That brings me to Tig Notaro, a comedienne who has been in the business for 18 years, but skyrocketed to fame in the past three years after a series of unfortunate events inspired a bold stand-up set. 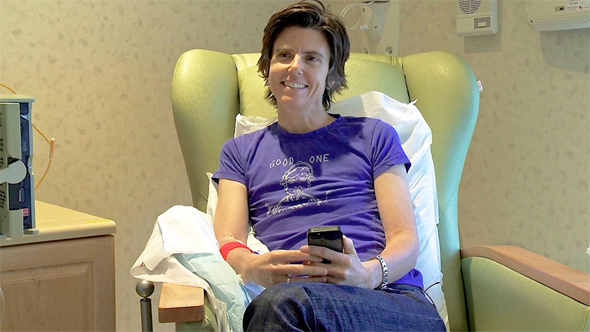 In the span of a small amount of time, Tig Notaro was diagnosed with C. diff (Clostridium difficile), followed by the death of her mother just a few days after the comedian's birthday, and ending with the final punch of breast cancer. But rather than let it keep her down, Notaro put together a darkly funny set at the Largo in LA for a very small audience about this series of tragedies, and overnight she became a viral sensation, even though the set wasn't recorded to be made available to anyone outside of the actual live show at the time. It was the word of mouth of comedians like Louis C.K. and stories about the suddenly infamous set circulating online that all of a sudden brought all eyes on her. But that's just half of the self-titled documentary Tig as Kristina Goolsby and Ashley York invade Notaro's life during some of the most difficult and private times. After recounting the tragedies and the huge fame that resulted from that career-changing set in Los Angeles, the cameras stick with Tig as she attempts to march onward into the future, both as a comedian with millions more eyes on her, and as a hopeful mother. It's this part of the film that we get the unique comedian's perspective on tragedy, and how someone whose job it is to be funny deals with the things that especially aren't humorous. It's fascinating, entertaining and very intimate. As Notaro continues on her career path, she's also concentrating on her personal life, finding new love with actress Stephanie Allynne (both can be seen in the Sundance selected In a World…). In fact, it's the early spark of this relationship that brings up one of the more unnerving parts of the documentary. In the chronicle of Notaro's eventual battle with cancer, there's footage of the comedian on the set of the aforementioned indie with Allynne, on days that she was feeling pretty sick, which which as we know now was as a result of the cancer. It's rather haunting to be able to see footage like this knowing what's in store for Notaro. Thankfully, as sad as much of this subject matter can be, Notaro's natural, dry sense of humor keeps things light, despite some serious tugs on the heartstrings. The personal nature of the doc brings the audience into the fold so seamlessly that you're pulling for Notaro and her partner every step of the way as they try to conceive a child through a surrogate mother, a procedure that was at great risk to Notaro herself due to hormone therapy that needed to be done in obtain to get an egg to fertilize. Since Notaro's cancer thrives on hormones, it was a risk that could have meant the return of the life-threatening illness. It's this level of personal, authentic footage that makes one section of the documentary feel completely out of place. There's a brief moment where Tig and Stephanie take a break from their relationship, and there's footage used to force an emotional tone that implies longing, but it's clear that the footage is being manipulated in such a way that feels like reality television (the directors have a background in this field). It takes you out of the film entirely, however briefly, and just wasn't necessary to add drama to the already powerful story being unfurled on screen. Tig packs an emotional punch, and also shines a fascinating light on the life of a comedian, both professionally and personally. While it opts for the more cheesy drama angle, it's such a personal, intimate portrait that it just works. While it could use a little more of Notaro's actual stand-material, this documentary is clearly made for those who haven't listened to all of the comedian's jokes on cancer and these tragedies. The accessibility of the documentary may make it less satisfying for those familiar with Notaro's career, but as a connoisseur of comedy, I can appreciate making this more of a documentary, and less of a stand-up concert movie. Anyway, there's still plenty of funny moments. Tig isn't perfect, but it's a compelling profile of one of the most unique and bold comedians working today, and that's what matters. The article is incorrect about Tig's famous Largo set. It was recorded on audio and was available to buy on Louie CK's site for a while and is now on iTunes with some added material. The album is called "Live (deluxe)" and is easily worth six bucks. At the time the set went viral, it was not available at all.